There are two main groups of lobsters which are all marine arthropods - Clawed lobsters (30 species) and Spiny or Rock Lobsters (45 species). The best known Clawed lobsters are the American and European lobsters - these are called "true" lobsters. 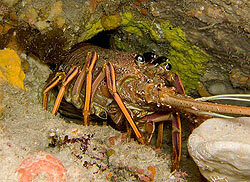 Marine spiny lobsters, some of which are also called crayfish in Australia, New Zealand and South Africa, do not have large claws, their first pair of legs are only slightly larger than the other four pairs. Lobsters are found in all the world's oceans. They live on rocky, sandy, or muddy bottoms from the shoreline to beyond the edge of the continental shelf. They generally alone in crevices or in burrows under rocks. 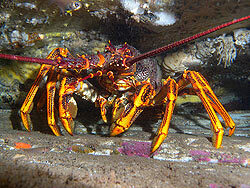 Lobsters are omnivores coming out at night to eat fish, molluscs, other crustaceans, worms, and some plant life. They also are scavengers when necessary. Their predators include bottom dwelling fish, such as cod, flounder, and eels, crabs, and seals. 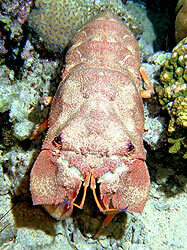 Most lobsters are 25 to 50 centimetres in length, Adult crayfish are usually 5 to 17.5 centimetres long. 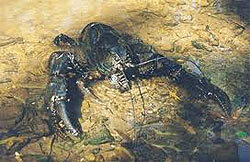 The largest lobster caught weighed over 20 kilograms They move by slowly walking on the sea floor. When avoiding predators they swim backwards quickly by curling and uncurling their abdomen. 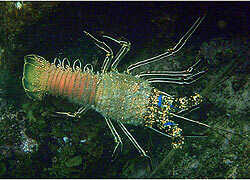 Lobsters must moult to grow, during the moulting several species change color. 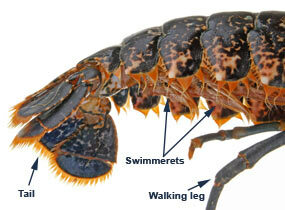 Lobsters have 10 walking legs; the front two acting as claws with one often being much larger than the other. Their antennae and tiny hairs that cover the entire body are sensitive to touch.Short bristles cover the insides of the pincers on the walking legs, these are taste receptors. Their head and thorax are fused into one section called the cephalothorax. Lobsters, like snails and spiders, have blue blood due to the presence of the blood pigment haemocyanin, which contains copper rather than iron which is in haemoglobin. 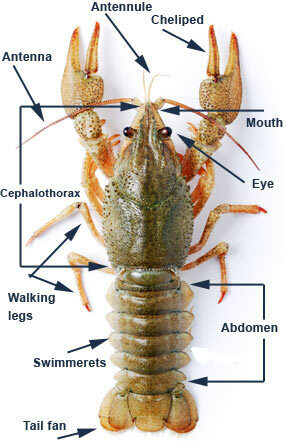 Lobsters possess a green organ, the hepatopancreas, which acts as both liver and pancreas. 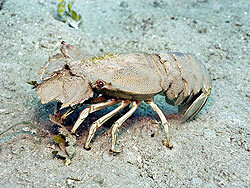 A lobster will moult up to 25 times in its first 5 years of life then ,as an adult, it will moult about once a year. 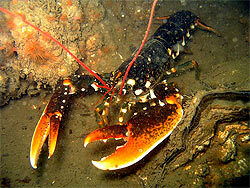 All lobsters and crayfish produce eggs which are carried by the adult female attached to the swimmerets. When they hatch they vecome part of the plankton for up to a year until they settle on the ocean floor. Crayfish.also known as crawfish, or crawdads are freshwater crustaceans resembling small lobsters, to which they are not closely related. They breathe through feather-like gills and live on the muddy bottom of freshwater lakes, rivers, dams and streams. Crayfish feed .at nightby crawling along the mud to feed on aquatic vegetation, worms, insects, molluscs and decayed organic matter. 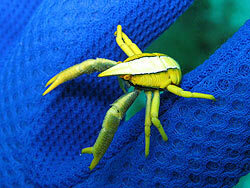 Their pincerlike claws are used to crush and tear food into smaller pieces. 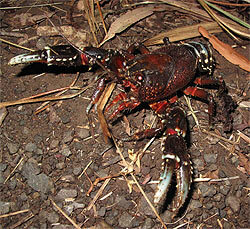 If scared the crayfish rears up, raising its claws threateningly. The fanshaped tail then propels the crayfish backward, flinging mud at the enemy. Australasia has over 100 freshwater species including the marron (Cherax tenuimanus), red-claw crayfish (Cherax quadricarinatus), yabby (Cherax destructor) and western yabby (Cherax preissii). The world's largest freshwater crayfish, Astacopsis gouldi, can weigh up to 5 kilograms and is found in the rivers of northern Tasmania. Squat Lobsters are not lobsters at all, but are more closely related to porcelain crabs, hermit crabs and, more distantly, the true crabs. They belong to a group called the Anomurans. The 870 species are found worldwide in theall the oceans from near the surface to deep sea hydrothermal vents, living mostly in rock crevices and under boulders. They are much smaller than the true lobsters usually with flattened bodies and the abdomen is usually curled under its body. The front legs are very long with long claws. Most of them are are scavengers, scooping up muddy or sandy deposits to sort out edible bits with their mouth parts. Some are predators of small fish, larger fish are also one of their predators. Their big eyes give them good vision, and flapping their muscular tail propels them backwards at high speeds. 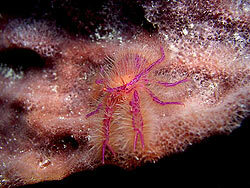 The largest species of squat lobster growis up to 19 cm in length. Despite their size, Squat Lobstersare considered to be a delicacy in Europe.